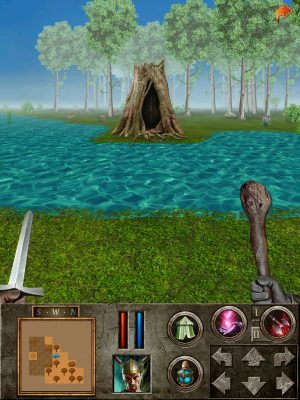 Redshift’s The Quest ($4.99) was originally released for Pocket PCs and Palm devices, but it found new life when the game was ported to iPhones in March of 2009. Its massive size and depth, combined with a seemingly endless parade of new content through regular expansion pack releases, made it one of the best RPGs on the platform, and for many people, the only one they ever needed. Surprisingly, the years have been generally kind to it in most regards, so it still plays as well as it ever did. Only a few respects betrayed the game’s age. One of the most obvious points is that it offered no iPad-native version, forcing tablet owners to play it with a less-than-flattering zoom applied to the visuals. As detailed as the graphics in the original port are, they’re clearly coming from the pre-retina days of mobile gaming, and while that’s not something I mind terribly, it made the game look too old-fashioned for some. At the same time, it’s not like Redshift could wave a magic wand and make the game look great on modern devices. The Quest is a massive game packed with tons of art assets, even setting aside the expansion content. Since it’s basically all 2D spritework, everything needed to be redrawn if the game was going to look good in higher resolutions. A major undertaking, to be sure, and perhaps not one that could be justified by the iPad alone. Luckily, Redshift also wanted to do a PC and Mac port of the game, a move which provided further justification for a remake. Those versions released several months ago, allowing the developer to once again turn their attention to iOS. After more than a half-decade, iPad owners can finally get their Quest on with a native app that not only offers redrawn graphics and a new interface, but also makes a number of other improvements. Let’s get the bad news out of the way first. The Quest HD ($7.99) only includes the core game. None of the previous expansions are compatible with this version, nor are compatible versions available. While it seems almost certain that the first expansion for the game, the Redshift-developed Islands of Ice and Fire, will be released down the road, it seems unlikely at this point that any of the following Zarista-developed expansions will get a similar treatment. You can still play and enjoy those expansions with the original version of The Quest, and Redshift plans to keep all of them available, but if you want to enjoy the benefits of The Quest HD, you’ll only be able to do so with the Redshift-developed content. Fret not, however, for the content included in The Quest HD will keep you busy for a very long time. The world is big and packed with things to do, and true to the name of the game, you’ll be trying to complete an awful lot of quests. Even beyond that, this is one of those RPGs with a world that feels alive, to an extent, so even the simple act of wandering around, picking flowers, and jamming your sword into the occasional goblin head carries a certain joy. You can solve everyone’s problems, dress up in a stylish outfit, and earn the cheers and admiration of the people. But if you want to spend your time picking pockets and locks from the shadows, who am I to judge? Even the matter of how you complete the quests offers you some choice. One early quest has you seeking out a kidnapped wife at the behest of her husband. When you find her, well, let’s say she’s not exactly unhappy about the situation. It’s your call what to do. 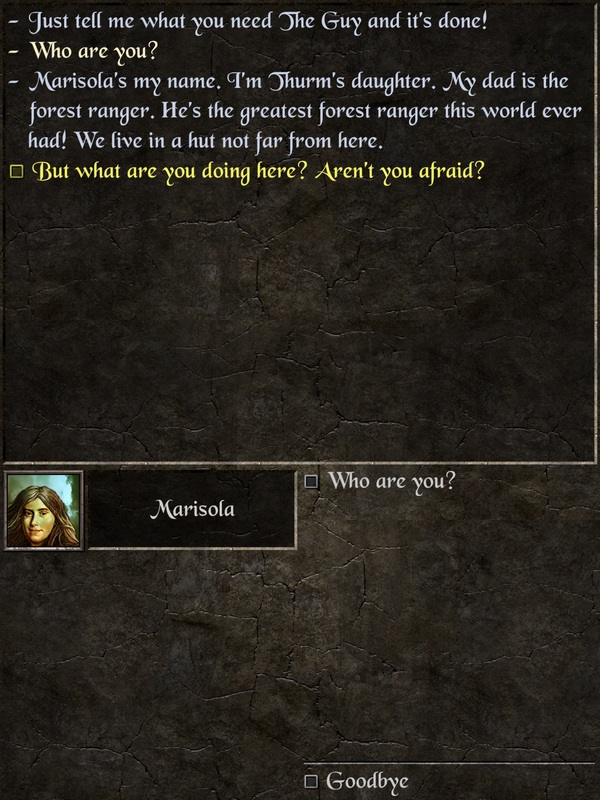 That sort of thing gets to the heart of what makes The Quest such a good game. It blends the thrills of emergent gameplay that well-designed open-world games usually offer with the drama, punch, and pacing of a more scripted affair. As such, the game neither feels aimless nor rigid in its design. Your quests might take you off the beaten path, but as you check them off, you’ll find that you’ve moved in the right direction for the next step of the game without even necessarily realizing it. 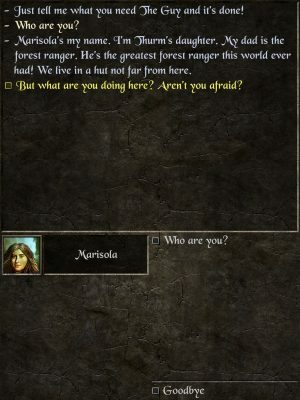 This is something games like Daggerfall and even the later Ultima games did very well on PC, and it feels like something of a lost art in today’s open-world RPGs. It’s fun, exciting, and most importantly, rewarding. If there are any major cracks in the game’s flow, it’s at the very start, where you might be paralyzed by the choice of which direction to head off into. The map design and initial quests funnel you well enough if you let them, but The Quest puts a lot of faith in the player right from the start. The enjoyable mechanics and large amount of content make this a winner from the mechanical perspective, but I also greatly appreciate the game’s personality. It can be a little vulgar at times, and it’s not shy about occasionally going for low-hanging fruit as far as jokes are concerned, but I enjoy the tone of the writing in this game. Knocking on doors will sometimes allow you to hear one piece of a conversation that has absolutely no bearing on the game at all, but adds a lot of flavor to the world itself. Among the quests you’ll accomplish, there’s a good variety of silly, sad, funny, triumphant, and downright somber outcomes. One quest might have you cackling at a cheap laugh, while the next might have you reflecting at its surprising poignancy. Perhaps as expected from a game from such a small team, you can really feel the personal fingerprints of the developers all over The Quest. I like that. Mechanically speaking, there’s not a lot to The Quest that you probably haven’t seen before in another RPG, particularly if your roots stretch back far enough. First-person exploration and turn-based combat make up the bulk of the game, with occasional forays into mini-games like playing cards or solving puzzles. Leveling up, scoring more powerful gear, and training your skills are all important for making forward progress against the increasingly-powerful enemies you’ll come across. You’ll also need to mind your reputation and make sure you don’t make trouble for local law enforcement. Unless, that is, you want to do that for some reason. Hey, you never know. But while there isn’t a lot of innovation here, everything is put together very well. A lot of games look like the classics if you squint enough, but not many of them manage to be as enjoyable to play when you stop squinting. While it evokes those classic PC RPGs of yore, The Quest‘s roots are in handheld hardware, and it from a design standpoint, it shows. You could easily sink hours into the game if you’re inclined, but the quest-based structure and detailed quest log make it ideal for shorter sessions as well. If you’ve got a medium-sized chunk of time to play, you can duck in, check off a simple quest or two, plumb a smaller dungeon, and call it a day. If you’ve only got a handful of minutes, you can fire it up, slaughter a couple of monsters, brew up some potions, and jump back to the real world. However much free time you’ve got, The Quest is there for you. In addition to the graphical overhaul and new UI, The Quest HD fixes a number of bugs from the original version and offers a greatly improved soundtrack. It’s an excellent remake, such that it’s a little hard to go back to the original version after playing this souped-up modern take. At the moment, it’s only available on iPad, but the developers are working hard on an iPhone version as we speak, so no one is going to be left out this time around. Indeed, if you have any love at all for RPGs, you’ll want to make sure this game is in your collection. Even if you already own the original, seeing The Quest looking this sharp is worth throwing down the money for the remake.